Problem Solving is the heart of an enterprise continued success in improving product design, processes and systems that enables all organizations operational and system functions for systematization of objective performance to achieve profit requirements. The success of an organization in today’s rapidly changing demands and environment necessitates the development of knowledge capital to drive and meet the rising performance requirements at a increasing accelerating rate. Already the high level of information accumulation at all level of society is accelerating. This has resulted in a great knowledge gap disparity between information availability and the ability of today’s resource seeking enterprises to harvest potentially available solutions that already exist in science but not yet in technology, and in technology but not recognize. TRIZ is a Russian made Inventive Problem Solving approach which in recent years has increasing emerged as a very powerful tool to make a significant contribution to close the many gaps between discovery, science, technology and applications. As a problem solving tool, TRIZ organizes the thinking processes to systematically, examine a problem (product design, process failure, system and organization dysfunctions) using a methodological approach to seek clever solutions that have been blocked by our own psychological inertia as well as the continued reliance on inadequate thinking process. In the design world, the needs for time compression from idea conception in creative innovations and technological development must comply with today’s fast speed race to succeed. Organization that are able to achieve this will accumulate knowledge capital for technological development. The Total Process Workflow is normally a given Delivery Cycle Time from Start to Finish. That is, from the beginning of the first process to the end of the last process. In other words, for every standard hour of work, the actual workflow time taken is 2.4 hours. The time taken for each order completion in terms of days depends on the hours worked per day, the number of shifts and duration of each shift. For a given order size, a batch workflow will usually have a poorer Workflow Factor. This is because of Accumulated Cycle Time, Waiting Time, Delay Time, Logistics Time, QA Inspection and Approval Time, etc. For Continuous Flow in small quantity such as a basket size, container size, bundle size or even one-piece quantity, the Total Workflow Cycle Time for an average order size will be smaller. This is because of the overlapping cycle time of smaller quantity flow concurrently at the same time, resulting in a shorter Total Process Workflow Cycle Time. Flow at one-piece at a time tends toward a Workflow Factor of 1, provided that the work process is short and well connected to subsequent processes with a balanced process cycle time. 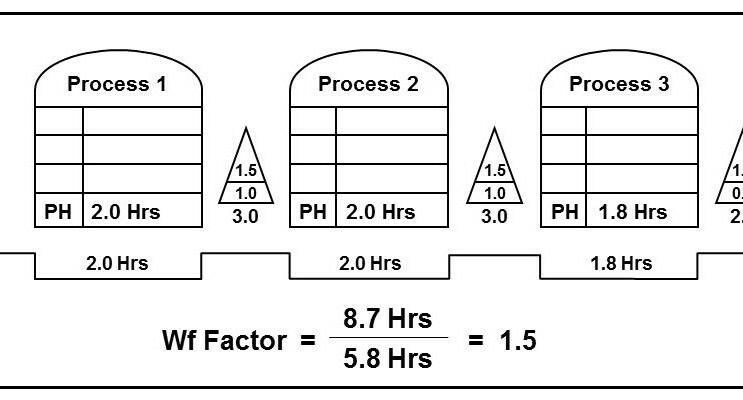 Achieving one-piece-flow does not necessarily attain a Workflow Factor of 1 if the production line is unusually long and the process cycle time is subject to occasional cycle time imbalance. Occasional Cycle Time Imbalance can result in a Line Loss of up to 30% capacity even in a one-piece-flow line. The use of a Cell-Line of about 12 operators comprising not more than 12 different operations can provide better control to secure balanced production time for reduced loss due to waiting, imbalance, delay, transfer, handling, etc.